The latest DPS Rent Index is out now! Recently we released the first ever DPS Rent Index. The Index, which is to be published quarterly, was developed by Professor of Global Economy, Joe Nellis - who was jointly responsible for the research and development of the UK's leading house price measurement systems, the Halifax and the Nationwide House Price Indexes - and Catarina Figueira, Professor of Applied Economics and Policy, both of Cranfield School of Management. The database is the largest of its kind, and is the most reliable indicator of rental trends in the UK. Last time, we found that since 2007, there has been a continuing trend of rents increasing across the UK year on year, despite the global financial crisis. We also found, when we looked at the third quarter of 2017, the average UK rent was £775.13, which was £157.69 (25.5%) higher than it was a decade before, and represented a third (32.59%) of median monthly salary. So what do the latest figures show? In 2017, average UK rents rose at less than half the rate they did in 2016. Crunching the numbers from a decade of data about millions of properties across England, Wales, Scotland and Northern Ireland, we found that the average UK monthly rent during 2017 increased by just 1.63%. This saw the national average go to £773.74 from £761.31 during 2017; this was half the rate of growth during 2016 (3.25% from £737.33). The slowdown was particularly pronounced in London, which saw the lowest increase in average rent of any British region, increasing by just £5.83 or 0.44% to £1,324.29 (from £1,318.46). Our Managing Director, Julian Foster, said: “Rent growth was slower in 2017 than 2016 when compared to inflation and wages, suggesting that general economic uncertainty is affecting the private rental sector particularly. “London’s growth was particularly sluggish, bringing down the national average further, although rents here and outside the capital remain a large proportion of wages. Excluding London, average monthly rent in the UK grew faster: £13.95 or 2.11% to £675.82 (from £661.88). Nevertheless, rent growth outside of London in 2017 was still significantly slower than in 2016, when the average increased by £21.78 or 3.40% (from £661.88). What about rent as a proportion of salary? For the first time since 2013, rental growth in 2017 was lower than the rate of inflation (2.70%). During 2017, incomes grew slightly faster than rents; average rent represented 32.54% of average salary (compared to 32.65% in 2016). Northern Ireland saw the highest percentage rise in average monthly rent during 2017: £18.76 or 3.66% (from £512.74 to £531.74), as well as the largest increase in rent as a proportion of salary during last year, rising by 0.85% from 23.88% to 24.73%. In the rest of the UK, the East saw the highest percentage rise in average monthly rent during 2017: a 3.15% or £24.57 increase from £782.44 to £807.01. 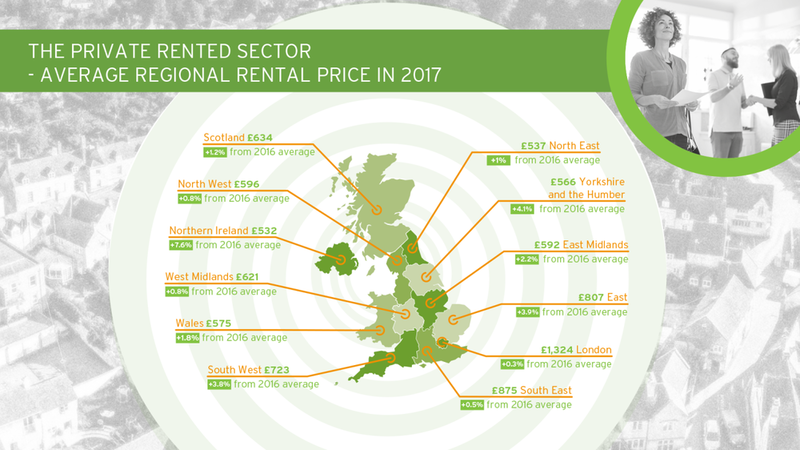 Rents in London represented the highest proportion of wages during 2017 (43.04%), whereas outside the capital, average rent in the South East represents the highest proportion of salary (35.01%); the North East the lowest (25.05%). Did the type of property affect the numbers? Rent for semi-detached houses experienced the biggest increase in value of the four property types during the course of 2017 (£18.93 or 2.43% from £780.57 to £799.50). Rent for flats experienced the lowest increase in value of the four property types: (£9.56 or 1.22% from £782.20 to £791.76). Read the Rent Index in full. On behalf of everyone at The DPS, we'd like to wish you a very merry Christmas. The DPS Rent Index is here! Our position as the largest provider of deposit protection in the UK gives us a unique insight into trends in the Private Rented Sector (PRS). This is why we’re delighted to announce the launch of The DPS Rent Index. We’ve worked with leading economists, Professor Joe Nellis and Professor Catarina Figueira, to develop the Index, which has the capacity to inform the rental housing market and shape both public policy and investor decision-making, in the same way that house price indices do for the owner-occupied housing market. We wanted to create a rent index that stands up to scrutiny and the highest standards of analysis, so we turned to experts with prior experience of creating complex statistical models that illuminate a market. Professors Joe Nellis and Catarina Figueira are leaders in their area and this provides the assurance we believe an index of this stature and importance requires. Indeed, Joe was co-developer of the Halifax and Nationwide House Price Indices. We've created The DPS Rent Index using a unique database drawn from 10 years of deposit protection in England and Wales, plus data from our sister schemes, LPS Scotland, and LPS Northern Ireland. The database is the largest of its kind, which makes it the most reliable indicator of rental trends. So what do the latest figures actually show? Over the last 10 years, there has been a continuing trend of rents increasing across the UK year on year, despite the global financial crisis (GFC). This saw London’s 3.47% compound annual growth rate (CAGR) representing the biggest regional increase and the 1.12% CAGR experienced in the North East as the smallest. The average UK rent in the third quarter of 2017 was £775.13, which is £157.69 (25.5%) higher than it was a decade ago, and now represents a third (32.59%) of median monthly salary. Throughout this period, the PRS has continued to grow and is forecast to represent 25% of all UK housing stock by 2020. However, there are indications that rent growth has slowed since the Brexit vote, with average UK rent only increasing by 1.51% annually (comparing Q3 2017 to Q3 2016), significantly slower than the previous three years and lower than average CAGR for the last decade (2.30%). Average rent also increased at a slower rate than inflation, which was 2.7% for the same period and, for the first time since the GFC, the average UK monthly wage grew faster than rent. What else has played a part? A ban on landlords and letting agents being able to charge fees to tenants for renting a property has been proposed and is expected to come in to force by the end of 2018. This has led to widespread industry speculation over whether this will increase rents as landlords look to recoup costs. As a result of The DPS Rent Index, we will now have a clear indication of how rents change over time in every part of the UK, allowing for a better informed view on how the PRS is affected by such changes – and how other economic factors relate to the cost of renting across the country. Julian Foster, Managing Director here at The DPS, said: “Figures suggest that the rental market has slowed nationally since the third quarter of 2016, and letting agents, landlords and tenants will be keen to see whether this trend continues over the next year. “This post-Brexit increase is the smallest witnessed since 2012 and comes after three years of particularly high growth, suggesting the influence of other macroeconomic factors such as housing, employment and inflation. You can read the full report here. Watch this space for further updates. We have integrated with Fixflo’s property repairs software so that if you ever have a dispute relating to a repair, you can send the Fixflo audit history straight to our adjudicators. For users on the Fixflo Plus complete maintenance management system, the integration helps us to get all of the information, photos and messages about a repair from start to end in a single, clear and chronological file. From your perspective, it saves you having to trawl through different inboxes and call notes to piece together the full history of what happened and when. Our friends at Fixflo are also running their annual survey in conjunction with ARLA Propertymark. The two minute survey gives you the chance to benchmark your repairs and maintenance function. To see the outcome of last year's survey, which included the below key trends, click here. Take the 2017 Rental Repairs Survey. Earlier this year we were delighted to hand over a cheque for £10,000 to The Lantern Trust, an independent charitable organisation founded in 1983 to benefit vulnerable and marginalised people in the borough of Weymouth and Portland. 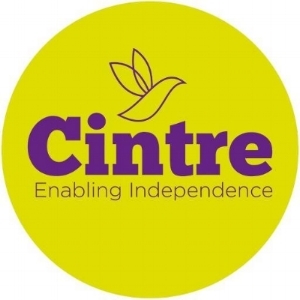 In partnership with Dorset County Council the Trust provides a specialised Housing and Resettlement Project for those in housing need, "endeavouring to meet the complex needs of our customers with a flexible and holistic approach." Using the money from The DPS Fund, The Lantern Trust has begun to find homes for 40 people across Weymouth and Portland. This donation will help The Lantern Trust provide interest-free loans towards rent deposits and rent. Daren King, our Head of Tenancy Deposit Protection, said: “We’ve donated over £200,000 to good causes over the last three years, and we’re delighted to extend our support to the Weymouth and Portland area. "The Lantern Trust does excellent work supporting socially excluded and marginalised people as well as reducing homelessness, and we’re glad that this donation is going to such an excellent project." Mike Graham from the Lantern Trust said: “Parts of our borough are among the poorest in England and we need to work together and with organisations such as The DPS that are willing to lend a hand. We’ll put this generous donation to excellent use, reducing homelessness locally and benefiting not just those individuals housed but also the wider community." We’ll return to the Lantern Trust in the future to find out more about how our donation has helped people in need, so keep an eye on our website. Recently, Ben Toms of our Account Management team visited the East Cleveland Youth Housing Trust (ECYHT) to hand over a cheque for £19,990 from The DPS Fund, and find out more about how they used our award. What is the East Cleveland Housing Trust? ECYHT works to help young people improve their lives in the community through offering a diverse range of opportunities and experiences. The Trust is developing in response to an identified need to tackle youth unemployment and lack of affordable housing. ECYHT sees itself as a solution to some of the training and housing issues that face young people who are at risk of becoming the most disadvantaged members of the community. Naturally such noble causes are at the heart of everything The DPS Fund stands for, and we’re thrilled to know such innovative and community-spirited work is going on; not only to solve people’s housing problems, but also to work in overcoming their personal ones. What did they do with their donation? The ECYHT team renovated the Crown pub in Brotton, North Yorkshire, and used our award to complete the project. Now it’s finished, the property houses four new tenants. Each tenant will receive regular one-to-one support from their Tenancy Support Worker, who will help them develop their financial knowledge, as well as reduce any isolation they’re feeling, and assist with emotional guidance. In turn, this will help them to have a successful tenancy, and ultimately empower them to take control of their lives. Rents are set at an affordable level so that when a tenant moves into work and comes off benefits, they’ll be able to keep their home based on the national minimum wage. What’s special about the renovation? This is community spirit with a difference. The renovation provided construction-based employment and training opportunities to local people, in order to give them valuable experience, and thereby improve their employability and self-confidence. Andy Pettersen, Social Business Manager at ECYH, said: “What an amazing contribution. Every penny has moved us closer to completing the largest housing project we've ever taken on. “The apprenticeships we offer help prepare young people for the transition into the world of work. They provide NVQs in construction and ensure that essential Maths and English qualifications are gained, at a level of C grade or above. Further to this we offer a variety of certified courses such as First Aid, Health & Safety and Asbestos Awareness. “Our focus is on helping to prevent homelessness and addressing young adults leaving care. The most common issues ECYHT are approached for help with are financial, employment based, associated with health and well-being matters or a mixture of these issues. We’re delighted to be able to help get this valuable project over the line, and we’ll be sure to return to North Yorkshire in the future to find out how our donation is continuing to help young people in need. Look at this in-depth summary of how the project developed over the last 18 months. Con artists and fraudsters are constantly changing their tactics to try and get their hands on people's money and personal details. Unfortunately, tenants are sometimes targeted, and this is one of the reasons we continually monitor the use of our service. In the past we identified a scam that targeted tenants using websites such as spareroom.com, and it appears that fraudsters are trying a similar trick again. First and foremost, we will never ask a tenant to make a payment directly to us. You should only ever make a deposit payment to your letting agency or landlord, and we advise that wherever possible you inspect the property/room in person before doing so. Always obtain a receipt. In many scams, communication is conducted via email. Tell-tale signs will be bad spelling or grammar and overly informal language (e.g. “finish the deal”). They may also try to make you feel under pressure to do what they want, and will sometimes ask you to confirm information that they should already have. That's a good rule of thumb; if you're unsure if an email has come from us, please forward it to us here and we’ll let you know if it’s genuine. Fortunately, fraudulent landlords and letting agents are rare. The majority are genuine and treat their tenants fairly. However, it’s always worth checking to see if your landlord or agent is a member of an industry body such as the Residential Landlords Association (RLA), the National Landlords Association (NLA). ARLA Propertymark, or the National Approved Letting Scheme (NALS). Membership of these schemes indicates that a letting agent/landlord is genuine and committed to improving standards in the Private Rented Sector. If you’re dealing with a letting agent, you can also check if they operate a client money protection scheme. The SAFEagent mark is an industry accreditation that shows an agent uses client money protection, which can also give you additional reassurance about the organization or person you’re dealing with. How else can I protect myself online? As we said above, if you’re still not sure if an email has come from us, please forward it to us here and we’ll let you know if it’s genuine. The latest Tenancy Deposit Ratings are out! Avid readers of our blog and anyone who follows us on Twitter will remember that earlier this year we released our second official Tenancy Deposit Ratings. For anyone who doesn't remember, every three months we crunch the numbers and calculate the average tenancy deposit for 100 post codes across England and Wales. So what's new this quarter? It's probably unsurprising that most places have seen very little change. While London saw a drop of about £75, residents of the capital will still have to part with an average of £1,750 when they begin a new tenancy. Likewise, anyone beginning a new tenancy in Cambridge will have to pay an average of £82 less for their tenancy deposit, but the average there is still over £1,100. Birmingham, Sheffield, Manchester, Bristol and Newcastle upon Tyne all saw very little change, but the average did go down slightly in all of those post codes. Where was the biggest change? Overall, Colchester saw the biggest increase, with the average tenancy deposit rising more than £300 from £576 to £905. Bournemouth also saw a sizeable leap from £780 to £1,032, while Enfield (where the average tenancy was already £1424) saw a rise of £215. Many things can affect the average tenancy deposit of a town or city. Places with a large student population for example will usually see bigger changes at either end of the academic year. One reason that deposit averages can differ in the last two quarters of the year is because of the timings of the postcode’s returning student population, whose deposits are often cheaper. This can also make the leap back up in the following quarter more pronounced. In addition to which, higher deposits are often linked to increased rents, as many landlords set them proportionately. How does my post code compare? Take a look at this table to see how the average tenancy deposit has changed where you live. From 15-19 May, letting agents and organisations from across the UK will once again come together in support of SAFEagent Awareness Week. SAFEagent was set up “by the industry, for the industry” to protect landlords’ and tenants’ money. Naturally, as a company that is committed to protecting tenants’ deposits, we’re fully behind it. During last year’s SAFEagent week, and throughout the year, they highlighted the importance of choosing a letting agent that is part of a Client Money Protection (CMP) Scheme. In an industry that’s estimated to be worth £2.7 billion, it’s vital that our customers’ deposits are safe. Of course, since then, the government has announced that CMP is to become compulsory for letting agents. This is a significant development within the industry, and thanks in no small part to the tireless work of SAFEagent. We’d like to encourage all letting agents to become members of SAFEagent. The blue and black SAFEagent ‘mark’ gives tenants and landlords the peace of mind that their money is protected. Today marks 10 years since the introduction of Tenancy Deposit Protection and the birth of The DPS. We’re delighted to reach this milestone and are looking forward to the next 10 years, but in the meantime we thought we’d take the opportunity to look back at a decade of protecting tenants' deposits and reflect on how we’ve grown. Click here to read our story. Here’s to the next 10 years! Here at the DPS, we love to give back to the community through our Charity Donations Fund, by donating to charities that focus their work in the housing sector. In the summer of 2015, we awarded £10,000 to the Colchester Emergency Night Shelter (CENS) to help them in their work supporting homeless adults. CENS offer help in a number of innovative and practical ways, from CV writing to providing emergency accommodation. They also concentrate on helping people who currently use the shelter to find and retain a long-term rented property. Throughout the first year of a new tenancy, CENS will guarantee rent payments, provide conciliation services if things go wrong, and continue to support the tenant to become an active member of the community. “We have used our DPS funding to start our ‘Keys for Keeps’ scheme. So far we have helped 7 people into their own private rented accommodation. We are very pleased to say that they have all maintained their tenancies and are still in situ. We have worked tirelessly to establish good working relationships with our landlords and this has had a very positive effect on our ability to support their tenants. Our landlords know that they can contact us with any concerns and we will, in turn contact the tenant to address the problem. “Upon admittance to the Nightshelter, we assess each individual to identify their support needs. As well as offering emotional support, we offer a range of practical courses to help people in their daily lives. We offer cookery courses, which include menu planning, budgeting, shopping and healthy eating. We also run a Job Club, where service users are taught how to job search online in order to fulfil the criteria for Universal Job Match. In addition, we work on budgeting with our Service Users to ensure they’re capable of managing their money when they move on. We also arrange for service users to attend first aid courses. We work hard to build up good relationships with our service users whilst they are at the Nightshelter once they’re re-housed, our Tenancy Sustainment Officer keeps this going. If our service users are struggling with any element of living independently, we encourage them to drop into the Shelter at any time during the day to see us for support. As an example, they may have received a letter they don’t fully understand or know how to deal with, and this is where the Tenancy Sustainment Officer (TSO) would offer guidance on how to deal with issues that may arise. The TSOs also carry out home visits to ensure that our users are maintaining the properties appropriately, and in accordance with their tenancy agreements. Marina tells us about a real life example of how our donation made a difference to someone’s life. “Arthur* was previously in a supported housing project but was asked to leave. He then stayed in bed and breakfast establishments until his money ran out. Then he became street homeless. He had an acute psychotic episode and was hospitalised for 4 days. He also had a severe issue with alcohol. Arthur was eager to be admitted to the Nightshelter as he believed our policy on breathalysing all residents known to have a drink problem every night would help him to abstain. He attended Alcoholics Anonymous regularly and one of the conditions of his stay was that he continued to attend. Arthur completely embraced the philosophy of Colchester Nightshelter. He was here for about 3 months and in that time he only failed the breath test once, which resulted in him being asked to stay out for the night. He attended every meeting that he was asked to and engaged wholeheartedly with the support and courses offered by the Nightshelter, attending cookery club, first aid, job club, and many more. We found a lovely private rented flat for Arthur and used the ‘Keys for Keeps’ fund to pay the deposit. We supported Arthur to make the change in benefits to his new address and helped him out with a starter kit of basic kitchen equipment and bedding. The flat was fully furnished so he did not have to worry about any major expenditure. Arthur has now found work and is happily settled in his flat. He still visits us regularly, but more on a social basis rather than because he needs support. He says he did not imagine when he was rough sleeping in Clacton last April that he would have achieved so much in less than a year. *name has been changed to protect the individual’s identity. Our latest tenancy deposit ratings are out now. Every three months we crunch the numbers and calculate the average tenancy deposit for 100 cities across England and Wales. Our sums have revealed that the average tenancy deposit for England and Wales is £970.18 – continuing to hover just below the £1,000 mark. While the rest of the country maintains a certain level of consistency, London postcodes set a new all-time peak, averaging £1,831.14, which is more than double the figure for the rest of England and Wales (£883.21 without London). To give you a clearer picture of what’s going on in your region, we’ve compared the 100 cities to the national average. How does your city stack up? Click here to find out. Our Managing Director, Julian Foster said: “…tenancy deposits can be demanding sums for tenants to raise when they move. It’s clear that these are challenging times for the Private Rented Sector and whether you’re a landlord, tenant or letting agent we’ve got some helpful tips and advice to help you get the most from your tenancy. Tuesday 3 January - 8am - 6pm (Business as usual from now on).